The common gull-billed tern (Gelochelidon nilotica) belongs to the family of terns, Sternidae. These tern species are distributed in Europe, Asia, Indian subcontinent, Southeast Asia, Africa, Australia, North America and South America. The common gull-billed tern is protected by the AEWA (Agreement on the Conservation of African-Eurasian Migratory Waterbirds). There are five recognized subspecies of the gull-billed tern. The common gull-billed tern (Gelochelidon nilotica) is closely related to Australian Gull-billed Tern (Gelochelidon macrotarsa). The five recognized subspecies of these gull-billed tern are: G. n. nilotica (J. F. Gmelin, 1789), G. n. affinis (Horsfield, 1821), G. n. aranea (A. Wilson, 1814), G. n. vanrossemi Bancroft, 1929 and G. n. gronvoldi Mathews, 1912. The common gull-billed tern (Gelochelidon nilotica) is a large, heavily built tern species, measuring about 35 to 45 cm in length and weighing 130 to 320 grams. The overall plumage of these common gull-billed tern species is whitish. Both the sexes look alike. The back and upper wings are pale gray. The breeding adults have black cap, extending from the base of the bill, to below the eye to the base of the nape. The non breeding tern adults have grayish patchy cap and dark eye patch. The throat, breast, belly, undertail and underwings are white. The bill is black, short and thick. The irises are black. The legs are long and black. The tern call is a two noted "kayr-wek" sound. The common gull-billed tern species are distributed in warmer areas of Europe, West Asia, central Asia, East Asia, Middle East, north-east Africa, west Africa, coastal regions of the Indian subcontinent, coastal Southeast Asia, north coastal Australia, coastal north-east and north-west South America, central America and Caribbean countries. The common gull-billed tern subspecies G. n. gronvoldi is distributed in French Guiana, east coast of Brazil, Uruguay and north coast of Argentina. The subspecies G. n. vanrossemi is distributed in USA (California) and West Mexico. These subspecies winter in Ecuador and north coastal Peru. The common gull-billed tern subspecies G. n. aranea is distributed in the east coast of USA (New Jersey to Texas), Cuba, Bahamas, Puerto Rico and eastern Mexican coast. These tern subspecies winter in Central American coasts and north-east and north-west South American coasts up to Brazil and Peru. The common gull-billed tern subspecies G. n. nilotica is distributed in South Europe, north and west Africa, Middle East, West Asia, Kazakhstan, Indian Subcontinent, central Asia and northeast China. These tern subspecies winter in tropical Africa, Persian Gulf and India. The common gull-billed tern subspecies G. n. affinis is distributed in east and southeast China. These subspecies winter in Southeast Asia, Indian subcontinent and Australia. The Important Bird and Biodiversity Areas (IBA) of common gull-billed tern in Mexico are Bahia de Ceuta-Cospita, Huizache-Caimanero Lagoon System, Geotérmica Cerro Prieto, Marismas Nacionales, Lago de Texcoco, Lagunas del Playón de Mismaloya and Laguna Cuyutlán y Estero Palo Verde. The common gull-billed tern species do not normally occur in forests. These species occur in altitudes from 0 to 100 meters. The common gull-billed tern inhabit natural marine and wetland ecosystems. The natural ecosystems include marine coastal lagoons and lakes, brackish coastal lagoons and lakes, estuaries, coastal sand bars and dunes, sandy beaches, freshwater lakes, rivers, streams and creeks. These tern species also inhabit artificial, aquatic and marine ecosystems. 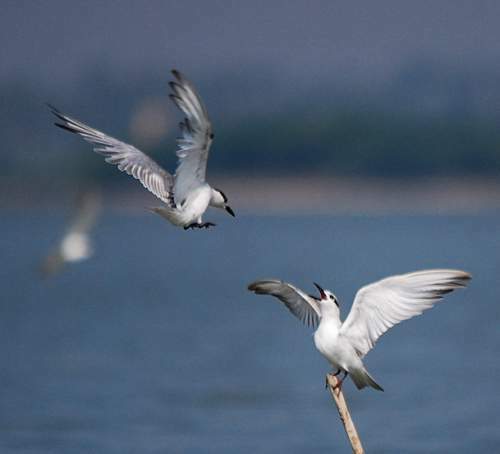 The artificial ecosystems of the gull-billed tern include irrigated lands, irrigation canals, aquaculture farms and water storage areas. The diet of these common gull-billed tern species is mostly insects. Fish, crabs, amphibians, lizards, aerial and aquatic insects and chicks of other birds are the primary food. They are found to scavenge around fishing boats and ships. These terns hawk insects on the wing. The breeding season of these common gull-billed tern species is during May and June in Europe, North Africa and North America. The breeding season in India is during April and May and it is during May in China. These common gull-billed tern species breed in colonies on beaches in marshes, estuaries, lagoons, plowed fields and lakes. Elaborate courtship and display takes place on ground, involving posturing, bill pointing and the male feeding the female. 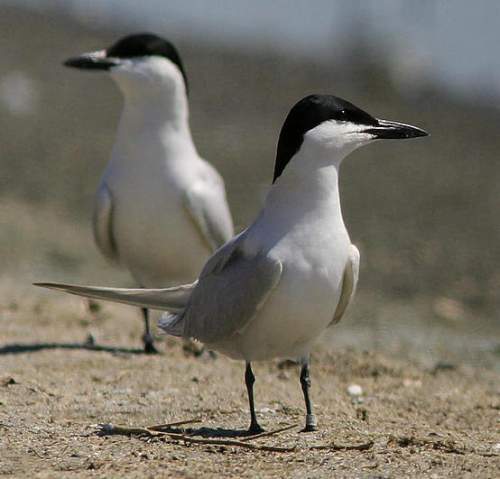 The gull-billed tern nest is a scrape on sandy or gravel beaches, dry mudflats or on floating vegetation. The rim of the nest is lined with shells, twigs, grasses or other objects. The typical clutch contains two or three pale buff eggs with brown spots. The common gull-billed tern chicks hatch out in about 22 days and in a few days move to nearby plant cover for safety. The chicks fledge by 5 weeks and the parents keep feeding them for three months or more. The whole tern family migrates southwards for wintering. The gull-billed tern is a migratory bird. Breeding populations of common gull-billed tern occurring in northern ranges in Europe and Asia, migrate to Africa, India, Southeast Asia and Australia for wintering. The subspecies from North America winter in the coasts of Central and South America. Post breeding, the tern juveniles may disperse and establish in new locations within the range. They may make local movements for feeding and breeding within their range. The global population size of the common gull-billed tern (Gelochelidon nilotica) has not been estimated following the taxonomic split. The overall population trend of these species is considered to be declining. Throughout its range it is reported to be common to very common. The generation length is 11.7 years. Their distribution size is about 145,000,000 sq.km. The common gull-billed tern (Gelochelidon nilotica) does not approach the thresholds for being Vulnerable either under the range size criterion, or the population trend criterion or under the population size criterion. Loss of habitat due to wetland drainage and agricultural expansion is the main threat that may endanger the survival of these tern species. 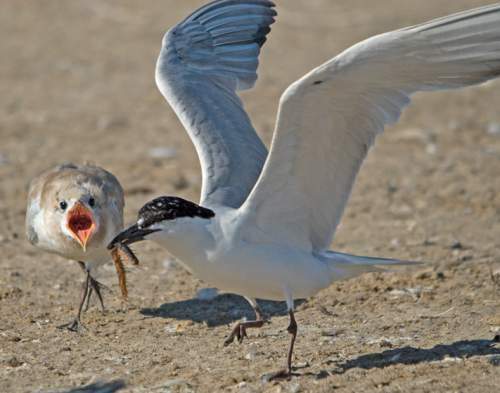 The IUCN (International Union for Conservation of Nature) has categorized and evaluated the tern species and has listed it as of "Least Concern". CITES (the Convention on International Trade in Endangered Species of Wild Fauna and Flora) status is ‘Not Evaluated’ for the common gull-billed tern (Gelochelidon nilotica). Current topic in Birds of India: Common gull-billed tern - Gelochelidon nilotica.